"This easy salad recipe will thrill all of your guests! A bowl of mixed greens is adorned with bits of apple, chopped walnuts, and Gorgonzola or feta cheese, and tossed with a prepared raspberry vinaigrette." 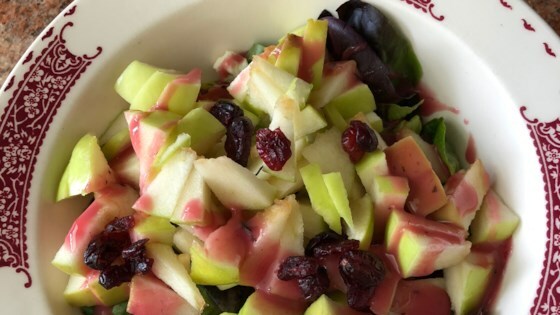 In a large bowl, combine salad greens, walnuts, cheese, and apples. Toss with raspberry vinaigrette, and serve. A green salad gets dressed up with sliced pears, candied pecans, and blue cheese. You may substitute feta for the Gorgonzola, if you prefer. This salad was ok. Not a recipe I will keep but an alternative to a combination salad. Needed more zip. Great combination of flavors with the apple, cheese and walnuts-easy too! Just like they serve in expensive restaurants -- for a fraction of the price. Very delicious! Fantastic salad! We ate it up. Will definately make again. Great salad. However, there was too much cheese and apples for the amount of lettuce. Next time I will either double the amount of lettuce - or cut the cheese and apple amounts in half. Excellent salad, very quick and easy. Gourmet-like. great recipe. i doubled the lettuce, used 1 and 1/2 chopped apples and only 4 oz of gorgonzola cheese. it turned out yummy. Great salad. I would not reccommend adding dressing until last minute as it made my greens kind of limp. Wonderful flavor and presentation. Will make again! !